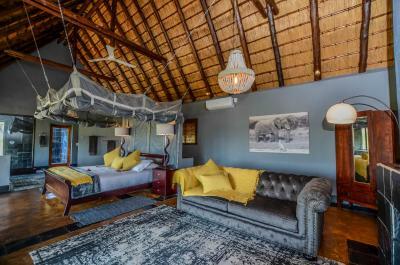 Lock in a great price for Nkorho Bush Lodge – rated 9.5 by recent guests! Wow! Amazing place and amazing staff. 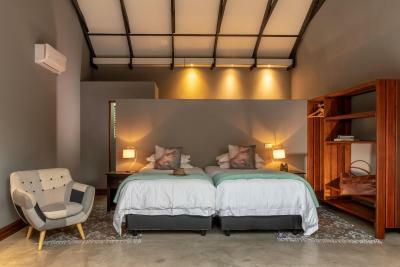 The room: very comfortable, nice bathroom and a very cool outdoor private shower! Game drives: I know it’s sometimes more luck, but we saw so many animals it’s crazy!! We had Call as our ranger and Chris as our tracker- they were so nice, and it really felt like they are taking the extra mile to help us see more animals. The place: there’s a waterhole/dam near camp and it brings a nice amount of animals. Food: great food! Very tasty. You will not be hungry here (we actually felt like we were over fed haha). We didn’t go on any bushwalks because we saw so many animals on the drive and preferred to drive a bit more than to walk. Nkhoro is a small facility, so not more than 16 or so people in the lodge at any given point in time. We are vegetarians and had let them know in advance, and they took great effort to make sure we had vegetarian food at all meals. The staff is friendly and helpful. We saw a leopard mom with 2 small cubs and that was a real treat. We loved the staff and the game drives. Absolutely wonderful. 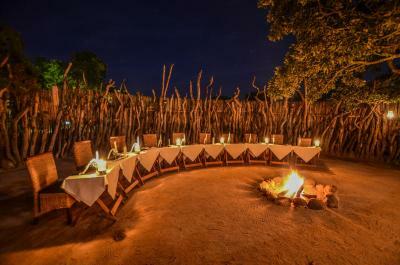 Excellent structure, very good game drives, experienced guides. For sure you will see the Big 5. The experience from checkin to checkout was phenomenal. Upon arrival we were greeted with a refreshing towel and cold water. The game drives (in our case led by ranger dawie) at 5.30 am and 4 pm were excellent, we were given free mosquito spray as well as water, chocolates etc every day. We saw the big 5 + wild dogs (quite rare). 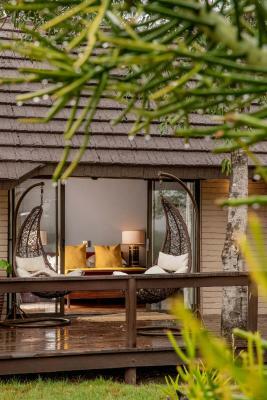 The pool and deck on the premise are great to relax in and the massage was excellent. Breakfast and lunch were extensive and beverages are quite cheap to purchase. Honestly one of the best experiences we’ve had when staying at an accommodation. The people here make you feel really at home. When you do stay make sure you read up on the customary tips for the ranger and tracker (these two are the real MVP’s!). You won’t regret coming here, going to Nkorho is a stay you’ll never forget. This place was heavenly. 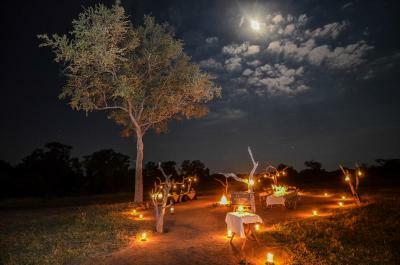 Incredible game drives, awesome staff, and delicious food. We can't wait to come back! Amazing Safari experience. The staff were super friendly & knowledgeable. Saw the big 5 in one trip out plus so much more. Would recommend it to anyone. 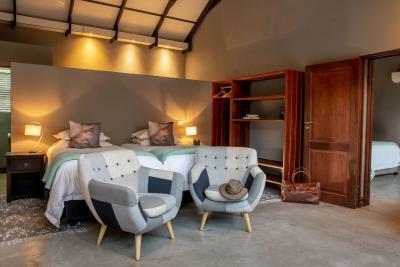 Offering an outdoor pool, Nkorho Bush Lodge is set in Sabi Sand Game Reserve overlooking the African plain. 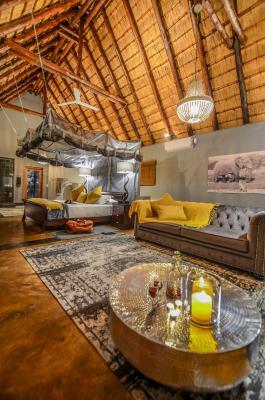 The lodge has stylishly thatched chalets and a traditional Boma. 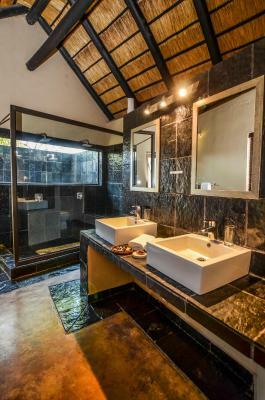 All chalets include a seating area, a refrigerator and tea-and-coffee making facilities. 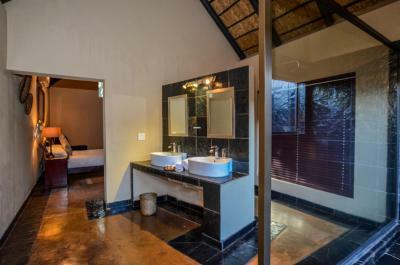 Each unit features a private bathroom with a bath or shower and free toiletries. 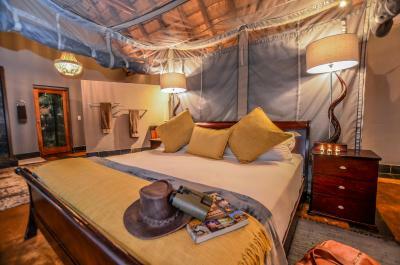 Guided morning and afternoon game drives are offered as well as nature walks. 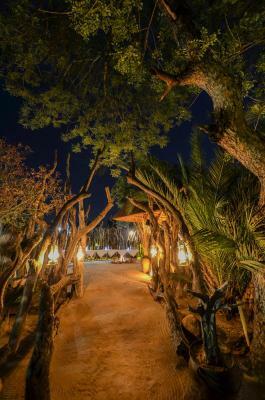 Guests can enjoy a drink at the on-site bar and free WiFi is available in public areas. Kruger Mpumalanga International Airport is 93 mi from the property. 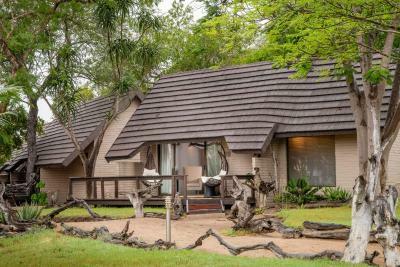 When would you like to stay at Nkorho Bush Lodge? 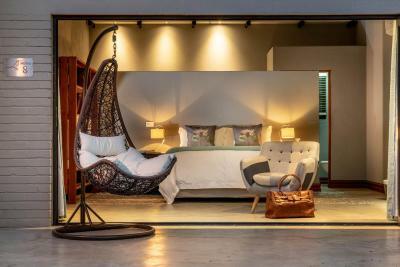 This suite features a view, mini-bar and sofa. This chalet features a tile/marble floor, electric kettle and mini-bar. This chalet has a mini-bar, electric kettle and seating area. 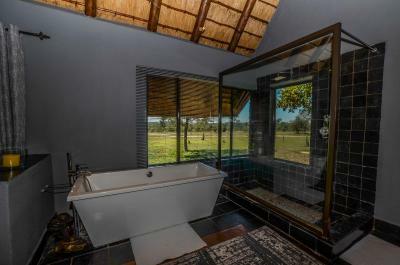 with garden, views this open plan chalet has a glass fronted bathroom. 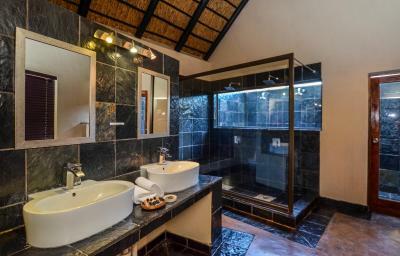 This chalet has a tile/marble floor, seating area and mini-bar. 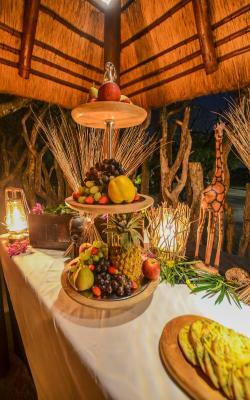 House Rules Nkorho Bush Lodge takes special requests – add in the next step! Up to two children under 12 years are charged ZAR 1995 per night when using existing beds. All children under 12 years are charged ZAR 1995 per night for extra beds. 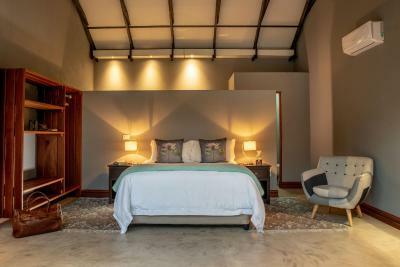 Any additional older children or adults are charged ZAR 3995 per night for extra beds. 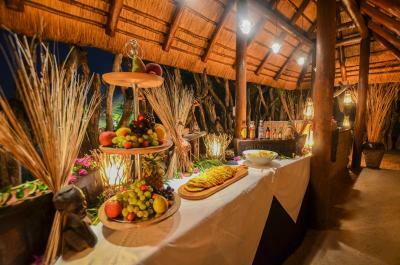 Nkorho Bush Lodge accepts these cards and reserves the right to temporarily hold an amount prior to arrival. 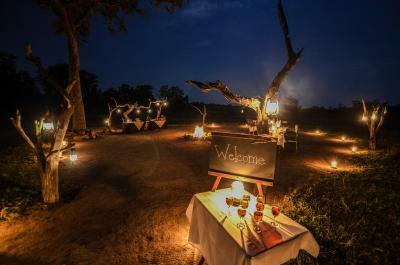 Please inform Nkorho Bush Lodge of your expected arrival time in advance. You can use the Special Requests box when booking, or contact the property directly using the contact details in your confirmation. The size of the reserve is very small. They are not allowed to drive into Kruger or any of the other private concessions. The main issue was that we constantly saw constuction/green scaffolding cloth, buildings, and other man-made structures during our game drives, which didn't give much of a sense of being in the bush (we had just spent 4 days self-driving in Kruger, so the difference was stark). Also, the drive to the lodge (esp. via Acornhoek) was terribly nerve-racking - filled with huge pot-holes for several miles and the staff completely neglected to mention this to us. The place is a pain to reach, especially if you are spending time in Kruger. The animals are used to jeeps and people and aren't as 'wild' as they are in Kruger. Food was hit or miss. Some meals were wonderful (venison stew!) and others were meh (frozen appetizers for lunch?!!). It was unpredictable. Lots of bugs. A mosquito net to keep bugs away when sleeping would make it perfect! The only very minor thing was that we weren’t a big fan of the dinner selection. We thought the breakfast and lunch selection of granola, toast, cheeses, charcuterie was really great it’s just that we were not massive fans of the in our opinion heavy dinners in the heat. 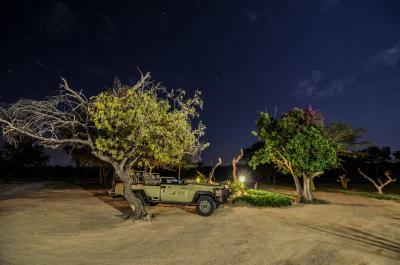 Great staff, fun game drives, good environment! Our guide, Arie, was fantastic and all the staff were unbelievably friendly. Sabi Sands was incredible and we saw the big 5 plus everything inbetween! We booked the honeymoon suite and it was fantastic! Large and with nice furniture. Wonderful terracce, very pieceful. Arrie, our guide, and Victor the tracker were amasing and found a lot of animals and told us a lot about them, very interesting.